The UK has been hit with heavy rain and snow as strong winds lashed much of the country - causing widespread flooding. More than 70 people have been rescued in north Lancashire as heavy rain caused widespread flooding and travel disruption across north-west England and North Wales. A number of roads were closed in the area and 27 residents were evacuated from their homes in the village of Galgate, near Lancaster, before sheltering in local pubs overnight. Lancashire Constabulary said emergency services, the Environment Agency and Lancaster City Council had received more than 500 flood-related calls, and attended over 100 incidents. 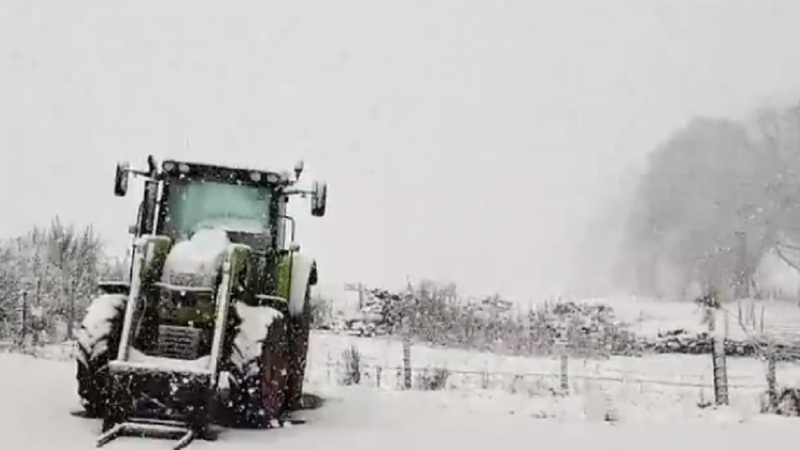 In Scotland, wintry showers are forecast to bring 0.7in to 2in (1.8cm-5cm) of snow to many parts of Scotland and up to 7.9in (20cm) on the highest ground, the Met Office said. Snow was beginning to accumulate on high ground on Thursday morning, with 1.7in (4.3cm) on Aviemore and 1.2in (3cm) in Altnaharra. A yellow "be aware" weather warning for snow kicked in just after midnight for the Scottish Highlands, Western Isles, Grampian, Strathclyde and Central, Tayside and Fife regions. The warning, which covers the morning rush hour and is valid until 1pm on Thursday, warns that some roads and railways are likely to be affected, with possible longer journey times for road, bus and train services. Weather Consultant Garry Nicholson told Farmers Guardian: "Flooding has affected parts of Wales and north-west England following heavy rain on Wednesday, when 100mm of rain fell over the hills in Snowdonia and the Lake District. "It will be chilly for Friday and the weekend with wintry showers for many northern and western areas of Britain and Ireland - a mix of rain, snow and hail, but resulting in a covering of snow for many hills. "Wind and rain will sweep across the country on Monday, but cold air will quickly return as winds turn northerly. "A wintry week then lies ahead, with snow and hail showers focused around coasts exposed to the wind in the north, east and west. A covering of snow is possible even to low levels. "Where showers move inland, significant snow may accumulate over the hills - especially the north-east Scottish Highlands, Borders, eastern Pennines, North York Moors and perhaps Snowdonia. "Meanwhile, inland central and southern regions of Britain should escape often dry and sunny next week. "Daytime temperatures will struggle at 3 to 6C or below, and blustery winds will feel sub-zero. "Where winds drop light overnight, frost and ice will form, with a risk of local hard frosts especially later in the week."